Ever since I found out I was accepted to the Kiva Fellows program, I've felt very fortunate. Fortunate to volunteer with an organization that does incredible work in the mission to alleviate poverty. Fortunate to be based in Hanoi, Vietnam, one of my top choices for country placement. Fortunate to spend three weeks in Cambodia (prior to Vietnam) in order to interview actual borrowers and hear about the positive impact Kiva's loans are having on their lives. 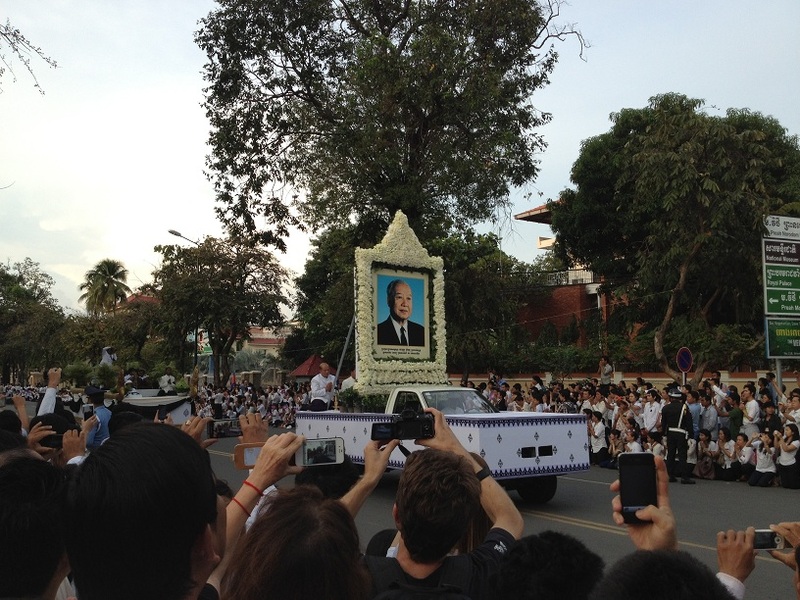 And finally, fortunate that my time in Cambodia coincided with a major cultural event: the funeral proceedings of the former King of Cambodia, Norodom Sihanouk. Though King Sihanouk died several months ago from heart failure, his body has been kept in an embalmed state to allow the Cambodian people (a.k.a Khmer, the predominant ethnic group) to pay homage to the man they affectionately call the "King Father". One of the large memorial tributes erected around Independence Monument. What effect did this have on Phnom Penh? Friday and Monday were declared public holidays to allow everyone to partake in the events. Most Khmer were dressed in the ceremonial mourning colors of white shirts and black pants/skirts, and many wore white and black ribbons bearing the late King's image. A number of major roads around the Royal Palace were closed off, resulting in massive traffic jams. 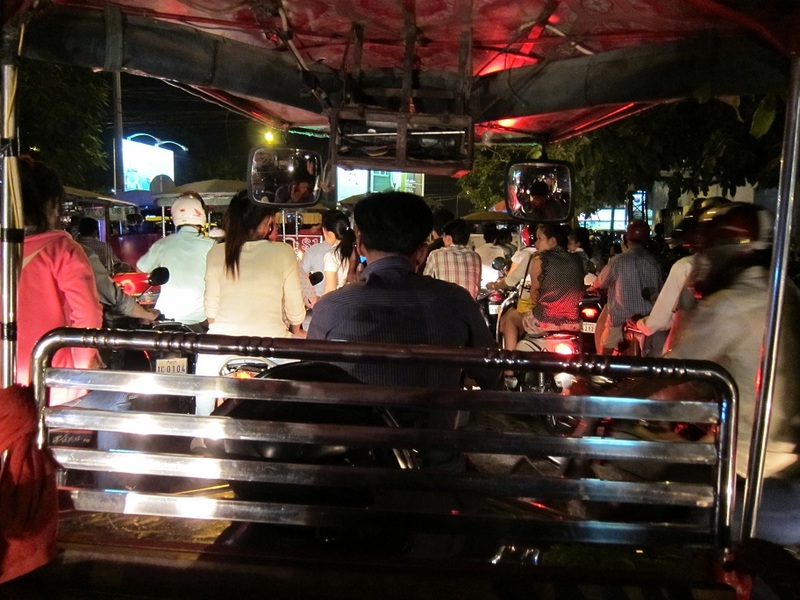 View from the back of a Tuk Tuk. "You might as well get out here," said the driver. I obliged. Bars and restaurants were technically prohibited from serving alcohol or playing loud music (much to the chagrin of many travelers on holiday). What is King Sihanouk's legacy with the Cambodian (Khmer) people? From speaking with a number of locals about the late King, the impression I'm left with is that he is still very much loved and revered within Cambodia, despite having received much international criticism for allying himself with the infamous Khmer Rouge. Perhaps his greatest achievement was leading Cambodia to independence from France in 1953, an accomplishment for which he is particularly beloved. King Sihanouk also cultivated a reputation as a man of his people, and someone who governed the country wisely. He focused money on developing the infrastructure of poor regions all throughout Cambodia and even helped to build some of their homes with his own hands. 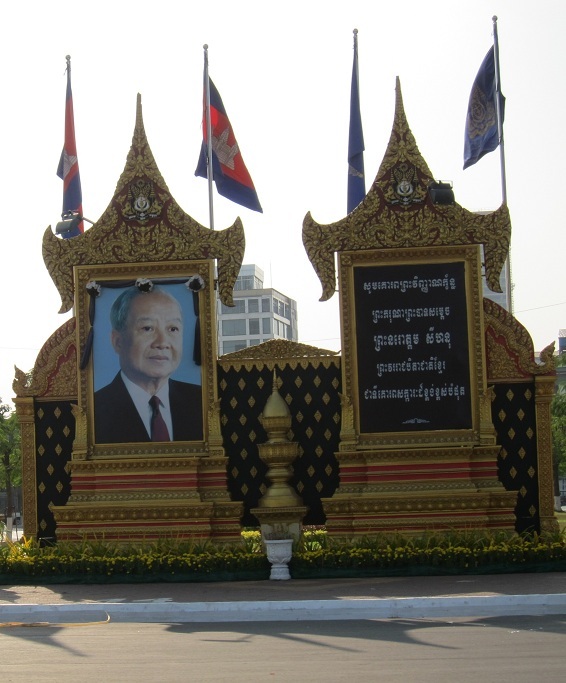 To the older generation of Khmer, Sihanouk will always be affectionately known as the King Father. Who does Cambodia turn to now? The political landscape of Cambodia will likely not change much, as the role of King is essentially a figurehead position with limited power. The real influence lies with Prime Minister Hun Sen, who has ruled Cambodia as the head of the Cambodian People's Party for roughly the past 30 years. The late King Sihanouk was formally succeeded in 2004 by his eldest son, King Norodom Sihamoni. Born in Phoenix and raised in Seattle, Jon earned his bachelor's degree in Finance and Business Administration from the University of Washington Foster School of Business. After graduating he spent time backpacking in Japan, Thailand, and Vietnam which sparked his passion for travel. Since then, he's explored several other countries in Latin America and Asia. Jon currently works in the Advisory practice of PricewaterhouseCoopers supporting organizations in the areas of program development and performance improvement. He is taking a sabbatical to volunteer as a Kiva Fellow and is thrilled to be working with field partners in both Cambodia and Vietnam.